When you are missing teeth, you have a number of options. If you have lost multiple teeth, you may decide implants are not right for you. You do not necessarily want healthy teeth removed for the purpose of wearing traditional dentures. Dental bridges is an option to consider. Dental Bridges For Your Dental Health: Missing teeth can lead to oral health problems. Home oral care can be more difficult. 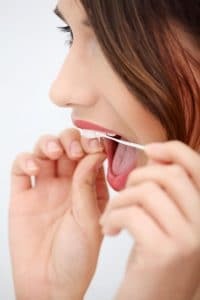 You may be so concerned about harming your gums that you do not floss and brush regularly. Missing teeth also increase your risk of future tooth loss. Healthy teeth can shift and move when they are not supported by other teeth. When you want to keep your remaining teeth healthy and strong, ask your dentist about a bridge. Dental Bridges For Overall Health: Missing teeth can increase your risk of the temporomandibular joint disorder. This condition can cause a wide range of health problems. When you are missing teeth, eating and chewing can be difficult. This can affect your digestive system and can interfere with a balanced diet. A Dental Bridge Is A Permanent Solution: Dental bridges can improve your dental health and your general health. It is as easy to clean a bridge as cleaning your natural teeth. Simply brush twice daily with a good toothpaste, and use dental floss. When you take proper care of your bridge, it can last for a lifetime. In addition to home care, you also need regular visits to the dentist. The bridge needs to be checked and cleaned the same as your own teeth. Another feature you will appreciate is today’s modern dental bridges appear completely natural. As it looks exactly like your own teeth, no one will know you are wearing a bridge except you and your dentist. There is more to dental bridges than improving your appearance. While you will be more attractive when you do not have spaces between your teeth, your health is even more important. Your natural teeth will last longer and stay in better condition when you have a bridge. It is a simple solution to long-term dental health.